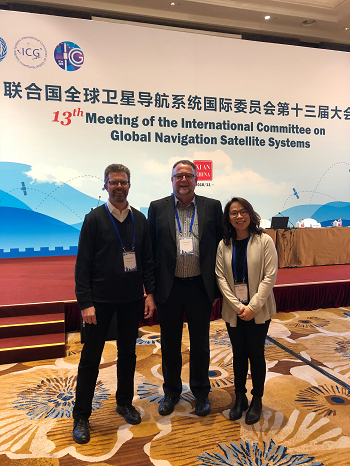 The Thirteenth Meeting of the International Committee on Global Navigation Satellite Systems (ICG) was held in Xi’an, China from 4 to 9 November 2018. The ICG has been formed as a result of recommendations of the UN Committee on the Peaceful Use of Outer Space (COPUOS), as ratified by the General Assembly of the UN. The International Federation of Surveyors (FIG) is an Associate Member of the ICG and has been involved since the start. We were there as the FIG representative to UNOOSA and to ICG. Mikael is FIG liaison to UNOOSA and Suelynn acted as FIG’s co-chair for Working Group D on Reference Frames, Timing and Applications. Matt has been involved in ICG since its start and acted a co-chair for Working Group D. This meeting attracted almost 400 people with representatives from all the GNSS/RNSS providers. There were also many representatives from other countries and non-government organisations. At the end of each meeting, the ICG issues a Joint Statement outlining the highlights of the broad scope of work across the ICG. Various presentations were made at the plenary sessions and working group sessions of the meeting and they form a very useful snap shot of the state of the art with the various GNSS and also with issues across key user groups. The Joint Statement from ICG-13, Working Group Reports and all presentations are available on the ICG Information portal. The joint statement is also included as Appendix A. With respect to education and capacity building in less developed countries, we also participate in education and outreach projects, in partnership with ICG WG-C, on “Reference Frames in Practice” workshops. Two were held in May 2018 at FIG Congress in Istanbul, and September 2018 in Fiji. The working group continues to contribute to the IGMA initiative, in particular through involvement in the IGMA-IGS Joint Trial Project. A related issue raised at ICG-12 was the looming overload of the International Laser Ranging Service (ILRS) ground network to track all GNSS satellites fitted with laser retroreflectors, which resulted in Recommendation #25. Laser tracking of GNSS satellites is an important means of independently determining the precise GNSS ephemerides, and hence evaluating the quality of GNSS satellite orbits computed by the GNSS Providers and third parties using GNSS measurements and models. The International GNSS Service (IGS) made recommendations to the ILRS on guidelines for the selection of GNSS satellites to be tracked by the ILRS, and for which periods and intervals. WG-D approved the IGS recommendation as the basis for future GNSS tracking and therefore ICG Recommendation #25 is now completed and closed. Satellite physical and geometrical properties related to the shape, mass, optical properties, dimensions and locations of radiating antennas permits improved orbit modelling, which in turn increases the accuracy of ephemerides and satellite clock correction determination. WG-D acknowledges that there has been some progress made in the provision of satellite properties by the GNSS Providers based on Recommendation #23 in accordance with the whitepaper titled “Satellite and Operations Information for Generation of Precise GNSS Orbit and Clock Products” released by the IGS. The IGS collects and makes available GNSS satellite properties to the user community. The working group noted some Providers are providing GNSS data from their tracking stations to the IGS and the working group will continue to monitor progress; demonstrate the benefits and encourage all GNSS Providers to contribute. WG-D noted progress on the Recommendation #21 on monitoring the offsets between GNSS times. In collaboration with WG-S a second joint workshop on this topic was held in Vienna in June 2018, and a common session was organised at ICG-13. Studies have been conducted by some GNSS Providers and in the timing community and the presented results allow characterisation of the offsets and identify several methods to improve their determination. Additional work is necessary for the Providers to assess the accuracy goals in the determination of the GNSS time offsets, so as to specify a recommended method to determine and monitor them. The common session between WG-S and D concluded that a further focused workshop should address these questions in 2019. WG-D held a joint meeting with WGs B and S to discuss “Interoperability of GNSS Precise Point Positioning (PPP) Services”. It was agreed that it is too early to decide whether this should become a new work item of the ICG. However, there was consensus that the topic is worthy of further exploration and that all 3 working groups should be involved. It was agreed that a useful way forward is to hold a dedicated workshop on PPP Services during the first half of 2019. There was considerable discussion on whether such a workshop should involve current commercial providers of PPP Services. It was agreed that in the joint meeting that the issue needs further discussion. In the WG-D meeting, it was suggested that it is possible for a workshop in 2019 to include all relevant stakeholders, this would be immediately followed by a closed session amongst ICG members and associate members. The working group held two working group meetings as well as joint meetings with other working groups. The minutes from Working Group D and other Working Groups will be available from the ICG web portal in due course as well as other official documents as e.g. recommendations and all presentations. India agreed to host ICG-14 in 2019. 1. The Thirteenth Meeting of the International Committee on Global Navigation Satellite Systems (ICG) was held in Xi’an, China, from 5 to 9 November 2018, to continue reviewing and discussing developments in GNSS and to allow ICG members, associate members and observers to address recent developments in their organizations and associations with regard to GNSS services and applications. ICG also addressed GNSS technology and services in a range of applications related to meteorology, space exploration, smart phones, high-precision applications, intelligent transportation, emergency alert, monitoring and assessment, and smart cities. 2. His Excellency Xi Jinping, President of the People’s Republic of China, sent a congratulatory letter, which was delivered by Wang Zhaoyao, Chairman of the China Satellite Navigation Committee. Officials from the Shaanxi Provincial government and the Chinese Academy of Sciences also addressed the meeting, followed by Luc St-Pierre of the Office for Outer Space Affairs. During the UNISPACE+50 segment, statements were delivered by representatives of Italy and the United States, as co-chairs of the Action Team on GNSS. The UNISPACE+50 segment reflected on achievements of providers and users of PNT services in promoting GNSS technology that benefit all people on Earth. 3. The Meeting was hosted and organised by the China Satellite Navigation Office. The Meeting was attended by representatives of China, India, Italy, Japan, Nigeria, the Russian Federation, The United Arab Emirates, the United States of America and the European Union, as well as the following intergovernmental and non-governmental organizations: Arab Institute of Navigation, Asia-Pacific Space Cooperation Organization, Civil Global Positioning System Service Interface Committee, European Space Agency, Interagency Operations Advisory Group, International Aeronautical Federation, International Association of Geodesy, Reference Frame Sub-Commission for Europe, International Association of Institutes of Navigation (IAIN), International Bureau of Weights and Measures, International Federation of Surveyors and International Global Navigation Satellite System Service. Representatives of the Office for Outer Space Affairs and International Telecommunication Union also participated. Australia, Korea and Laos were invited to attend as observers. The representatives of the regional centres for space science and technology education, affiliated to the United Nations, located in China, India, Morocco and Nigeria attended the meeting. A representative of Arab Information and Communication Technologies Organization was invited to attend as observer. Australia was recognized by ICG as a new member, and IAIN was recognized as a new associate member. 4. ICG recalled that the General Assembly, in its draft resolution (A/C4/73/L.4), had noted with satisfaction the continuous progress made by ICG towards achieving compatibility and interoperability among global and regional space-based positioning, navigation and timing systems and in the promotion of the use of GNSS and their integration into national infrastructure, particularly in developing countries. 5. ICG noted that the working groups had focused on the following issues: systems, signals, and services; enhancement of GNSS performance, new services and capabilities; information dissemination and capacity-building; and reference frames, timing and applications. 6. The Working Group on Systems, Signals and Services (Working Group S), through its subgroups and task forces, advanced all aspects of its workplan in the intersessional period between ICG-12 and ICG-13. The subgroup on compatibility and spectrum protection, continuing its campaign to promote adequate protection of GNSS spectrum through education and outreach, conducted a third Spectrum Protection Seminar, this time in conjunction with a United Nations/Argentina Workshop on the applications of GNSS held in Falda Del Carmen, 19 – 23 March 2018. This was followed by the 7th GNSS Interference Detection and Mitigation (IDM) Workshop, organized and conducted under the auspices of the subgroup, which was held for a second time in conjunction with the annual Baska GNSS Conference in May 2018. At the workshop, participants continued to investigate methods of implementing IDM capabilities through permanent network-based solutions and through crowdsourcing techniques. Through intersessional coordination that included a meeting of the subgroup held in June 2018 in Vienna, progress in encouraging national regulators to use relevant ITU protection criteria for GNSS was assessed and the compatibility of search and rescue downlinks broadcast by GNSS in the L-band was added to the scope of the subgroup’s work, envisaging cooperation with the COSPAS/SARSAT Programme and taking into account the role of the ITU and national administrations. 7. The subgroup on interoperability and service standards held two workshops during the intersessional period. The first focused on open service performance standards and international GNSS monitoring and assessment (IGMA). A dedicated team of experts working under the auspices of the subgroup was able to complete a document defining guidelines for developing Open Service Performance Standards, completing work that has been underway since 2012. The working group recommended that this guideline be formally adopted by the ICG. The subgroup also organized a second workshop focused on GNSS system time as recommended at ICG-12 and held the workshop in Vienna in June 2018 in conjunction with ICG Working Group D. The workshop and subsequent deliberations by the Working Group resulted in immediate actions related to assessing two concepts proposed by ESA and consideration of future actions. These will be further discussed at a third multi-GNSS time interoperability workshop. The Working Group also plans to join Working Groups B and D in conducting a workshop focused on Precise Point Positioning Services in 2019. 8. Finally, the Working Group continued to investigate methods to improve system-of system operations with a focus on the need to assess the adequacy of current orbital debris mitigation guidelines applicable to GNSS. he Working Group subsequently recommended that the ICG ask the Interagency Space Debris Coordination Committee (IADC) to conduct a study on Medium Earth Orbit and Inclined Geostationary Orbit (IGSO) in coordination with system providers. 9. Working Group on the Enhancement of GNSS Performance, New Services and Capabilities (Working Group B) made significant progress. China, Europe and the United States presented results on Lunar GNSS analyses and architectural studies performed by each region. NASA informed WG-B about the benefits of combined communications and navigation capabilities for space users. 10. Thanks to the excellent cooperation among all members of the GNSS SSV Taskforce, a major milestone has been accomplished by successfully completing the work on the GNSS SSV Booklet as ‘The Reference’ for the space user community. A new Space Applications subgroup was created by WG-B to focus on these issues. The Space Applications Sub-Group will be co-chaired by Interim co-chairs from US, ESA and China. 11. On the topic of Space Weather, the working group was briefed by China on the space weather payloads of BDS-2 and BDS-3. China, Japan and India presented the status of space weather and ionospheric research. Acknowledging the importance of Space Weather Information for GNSS and space users of GNSS, WG-B encourages the open exchange of space weather data. WG-B agrees that dedicated mechanisms should be investigated to share space weather data among the international community, and additionally to disseminate it to potential users in all regimes (Next Generation Broadcasting Service being one potential mechanism). 12. WG-B appreciates the information provided by China on the planned BDS Return Link Service (RLS) and the overview provided by NASA on the RLS discussions within COSPAS-SARSAT. WG-B shares the interest in interoperability of the SAR RLS. Taking note of the creation of a Correspondence Group by COSPAS-SARSAT, WG-B encourages the discussion of the RLS and an overall Concept of Operations by COSPAS-SARSAT. WG-B would like to receive feedback on the outcomes and will work to achieve interoperability within ICG. 13. EU and Japan jointly presented the Common Emergency Warning Services. The WG-B members share the need to further discuss the emergency warning service within the ICG WG-B. For this purpose, a correspondence group on EWS common format will be set up. 14. The Application Sub-group working activities and achievements were reported by the Co-chairs. The questionnaire structures and strategy are defined and points of contact from each provider have been identified. China introduced BDS applications on civil transport aircraft, indicating that the BDS short message function provides a new technological approach of real-time flight surveillance, tracking and emergency communication. India introduced NavIC messaging services and novel applications. Japan updated on the QZSS IGSO satellites’ advantages for offering a seamless and robust navigation integrity monitoring service. WG-B is encouraged by the ongoing ICAO standardization activities for Dual-Frequency Multi-Constellation SBAS, which includes consideration of the benefits that can be provided by the use of IGSO. 15. The Working Group on Information Dissemination and Capacity-building (Working Group C) considered educational programmes and activities carried out by FIG, ISMB/LINKS, the Beihang University, BeiDou International Exchange and Training Centre, CGSIC, the University of Tokyo, Tokyo University of Marine Science and Technology, the Russian Federation, the European Commission and the United Nations-affiliated Regional Centres for Space Science and Technology Education located in India, China, Morocco and Nigeria, in promoting the use of GNSS capabilities, particularly in developing countries. 16. The working group emphasized that ICG should strengthen cooperation with industry, government, academia, and other relevant institutions to improve GNSS education, training and capacity building. This would be accomplished through continued outreach to policy and decision makers, supporting the exchange of experts and educational resources, and increased engagement of women and young professionals. 17. The working group took note that the education capacity building index proposed by the Regional Centre for Space Science Technology and Education in Asia and the Pacific (China) will require further evaluation at the United Nations-affiliated Regional Centres to improve global facilitation of GNSS education development and capacity building. 18. The Working Group on Reference Frames, Timing and Applications (Working Group D) noted significant progress on the geodetic and timing references by the GNSS Providers. Specific progress was noted: (1) the refinement of the alignments of GNSS reference frames to the ITRF, and (2) the information on the GNSS timing references and the inter-comparisons of GNSS time offsets. WG-D noted that the templates on geodetic and timing references should be updated by the GNSS Providers to reflect the changes. 19. With respect to education and capacity building in less developed countries, WG-D members also participate in education and outreach projects, in partnership with WG-C, on “Reference Frames in Practice” workshops. Two such workshops were held, in May 2018 at FIG Congress in Istanbul, and September 2018 in Fiji. 20. WG-D continues to contribute to the IGMA initiative, in particular through involvement in the IGMA-IGS Joint Trial Project. A related issue raised at ICG-12 was the looming overload of the International Laser Ranging Service (ILRS) ground network with respect to its capability to track all GNSS satellites fitted with laser retroreflectors, which resulted in Recommendation #25. Laser tracking of GNSS satellites is an important means of independently determining the precise GNSS ephemerides, and hence evaluating the quality of GNSS satellite orbits computed by the GNSS Providers and third parties using GNSS measurements and models. The IGS made recommendations to the ILRS on guidelines for the selection of GNSS satellites to be tracked by the ILRS, and for which periods and intervals. WG-D approved the IGS recommendation as the basis for future GNSS tracking and therefore ICG Recommendation #25 is completed and closed. 21. Satellite physical and geometrical properties related to the shape, mass, optical properties, dimensions and locations of radiating antennas permit improved orbit modelling, which in turn increases the accuracy of ephemerides and satellite clock correction determination. WG-D acknowledges that there has been some progress made in the provision of satellite properties by the GNSS Providers based on Recommendation #23 in accordance with the white paper titled “Satellite and Operations Information for Generation of Precise GNSS Orbit and Clock Products” released by the IGS. The IGS collects and makes available data on GNSS satellite properties to the user community. 22. WG-D noted that some Providers are providing GNSS data from their tracking stations to the IGS. Working Group D will continue to monitor progress (in conjunction with IGMA), demonstrate the benefits and encourage all GNSS Providers to contribute. 23. WG-D noted progress on the Recommendation #21 on monitoring the offsets between GNSS times. In collaboration with WG-S a second joint workshop on this topic was held in Vienna in June 2018, and a common session was organised at ICG-13. Studies have been conducted by some GNSS Providers and within the timing community and the presented results allow characterisation of the offsets and identify several methods to improve their determination. Additional work is necessary for the Providers to assess the accuracy goals in the determination of the GNSS time offsets, in order to specify a recommended method to determine and monitor them. The common session between WG-S and D concluded that a further focused workshop should address these questions in 2019. 24. WG-D held a joint meeting with WGs B and S to discuss “Interoperability of GNSS Precise Point Positioning (PPP) Services”. It was agreed that it is too early to decide whether this should become a new work item of the ICG. However, there was consensus that the topic is worthy of further exploration and that all 3 working groups should be involved. It was agreed that a useful way forward is to hold a dedicated workshop on PPP Services during the first half of 2019. There was considerable discussion on whether such a workshop should involve current commercial providers of PPP Services. It was agreed in the joint meeting that the issue needs further discussion. In the WG-D meeting, it was suggested that a possible approach could be to hold a workshop in 2019 including all relevant stakeholders, which would be immediately followed by a closed session amongst ICG members and associate members.